A young curious mermaid exploring the shore. The first of a possible series. And I'm messing around with a story. 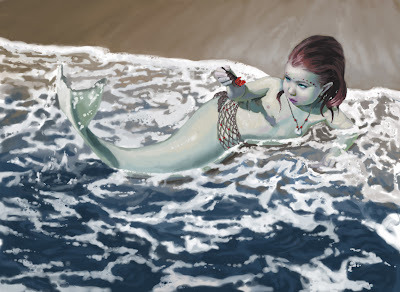 Of course, it was inspired by my preschooler who loves to pretend to be a mermaid. This is a digitally painted self portrait. As I perch on the edge of possibility, I long for my imagination to take flight. 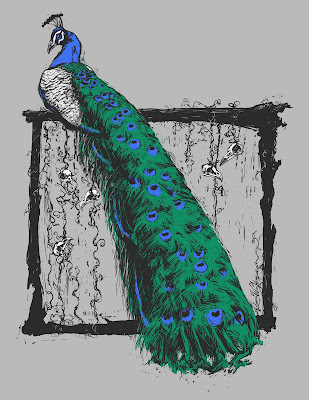 Like Dumbo, maybe all I need is a magical feather so I have the faith to take the leap. Keeping with the same style, process, bush (digital, of course), and color pallet, as the previous two paintings of flowers, I did a painting of my daughter. I intentionally tightened up the focal area while progressively loosening up as I moved away from the focal point. I think the effect is lovely. 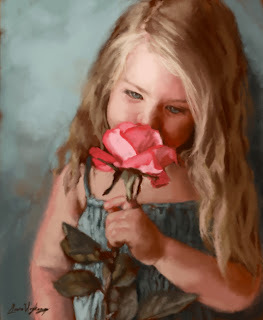 A very sweet painting of a very sweet little girl. I just inherited a few old instructional painting books from my dear grandfather who just recently passed away. 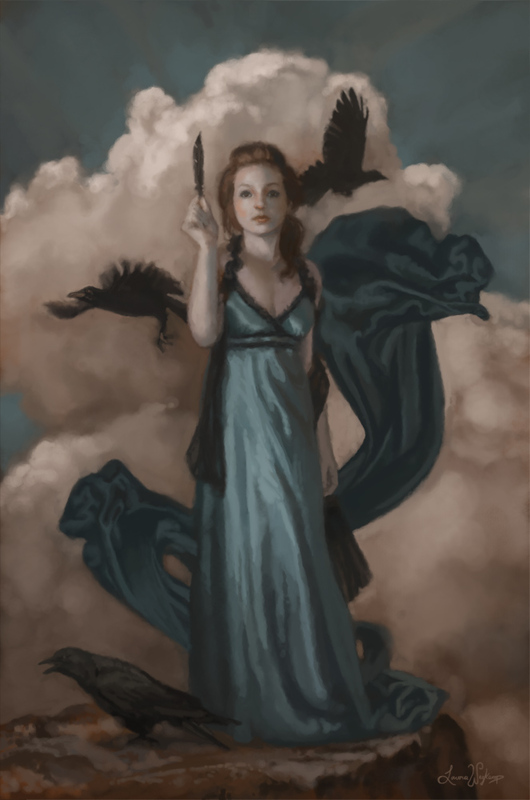 On a whim, I decided to do a quick copy of one of the paintings from a book by Claude Parsons for practice. 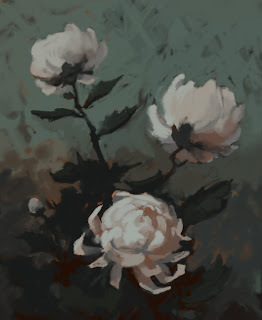 It's very helpful to study another artist's methods and techniques, their color pallets and design sense. It really helps you get out of a rut. This copy turned out pretty cool so I thought I'd post it. I used photoshop to paint it cause it's quick and easy and mess free, the original, however, was painted in oil. 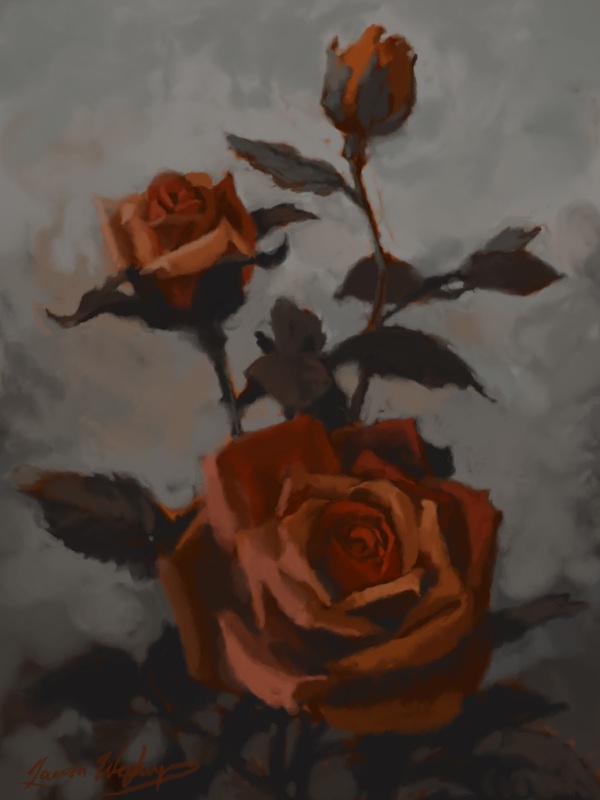 Using a similar color pallet, composition and technique, I created my own painting from some fake roses I also happened to inherit from my grandfather. The second painting is obviously inspired by the first. 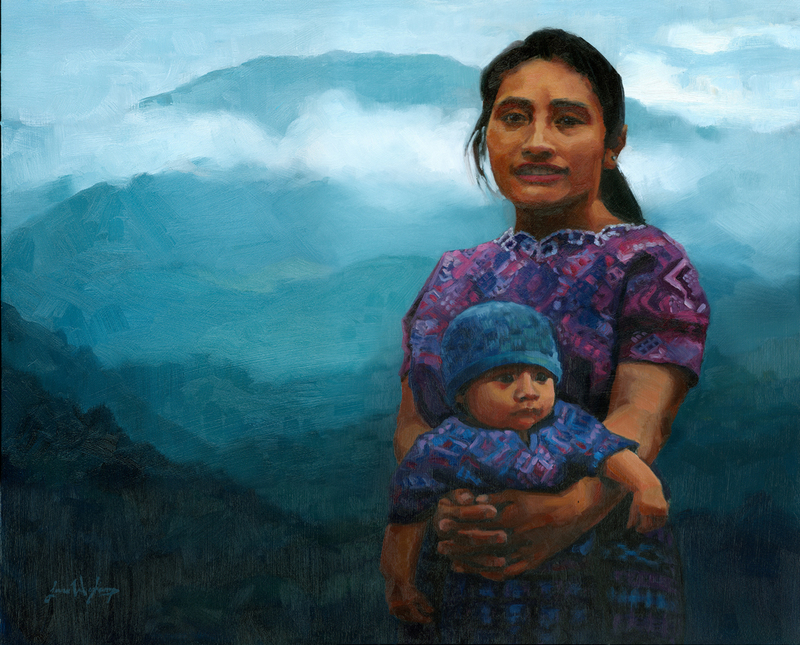 This is a composition I created from a couple photos I took while in Antigua, Guatemala in 2010. I really don't think the scan does it justice. The finish is very shiny and it catches the light from the scanner. I love painting the people from Guatemala and El Salvador, the descendants of the Maya. 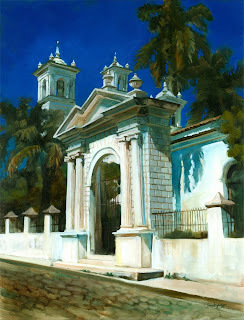 I have a couple compositions ready to paint from El Salvador. Because, at the time, I thought it would be cool, I did some t-shirt designs that will likely never become t-shirts. 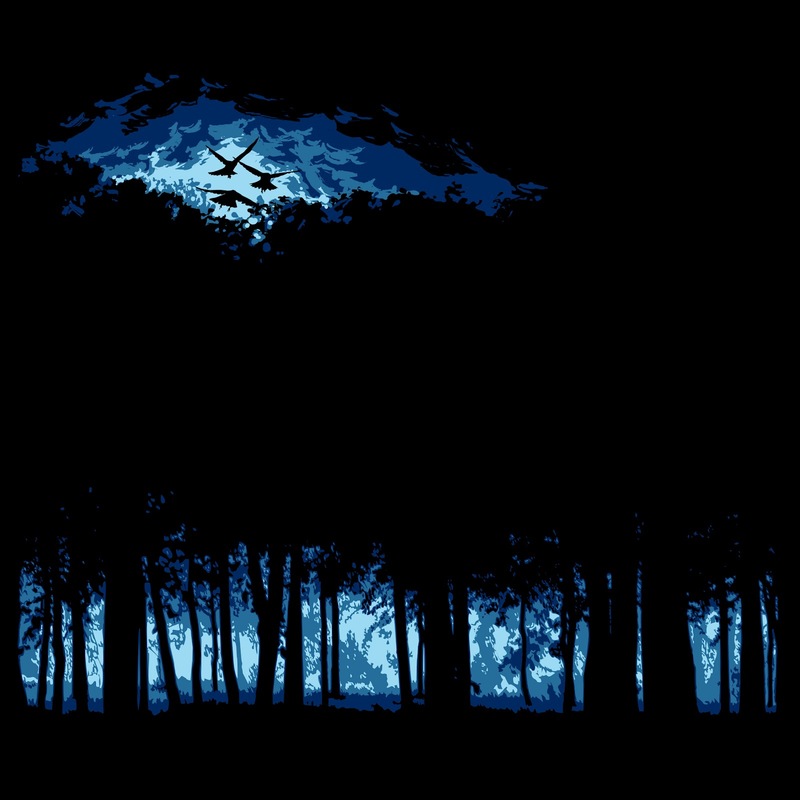 I'm not a graphic designer but I do enjoy messing around with digital stuff. And, because I just had a baby, it is likely that you will be seeing mostly digital stuff coming from me, since it's easier to sit down and do with the short and sporadic bursts of "free time" that motherhood of new babies affords me. 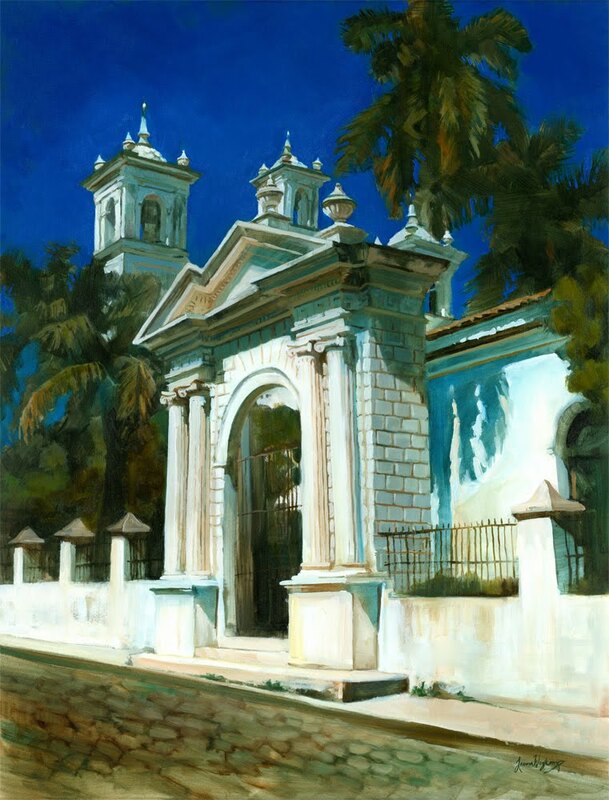 This is a larger, all oil, remake of the first Iglesia de Suchitoto. I repainted it because the first one was so popular and my dad asked me to. I think he wants it to hang on his wall in El Salvador.